It might be the ferragosto -- and, this year, not an obligatory feast -- but if you're just sitting there on this Assumption Day, you're missing out. For one, 15 August is a historic day in the annals of Stateside Catholicism -- in 1790, John Carroll of Baltimore was ordained the nation's first bishop in the chapel of an English castle. So beyond its vertical import, this could be considered the feast when the small, oft-persecuted band of believers scattered across the 13 colonies genuinely became a local church. In tribute, Carroll dedicated the nation's first cathedral to the Assumption... while some decades later and a tad north, this day likewise saw the cornerstone-laying of the "cathedral of suitable magnificence" that would become not just the US church's most iconic and cherished edifice, but a piece of Americana and house of prayer for folks of every faith. Even in our own time, though, the holy day's timing at summer's peak has brought about some traditions all its own. 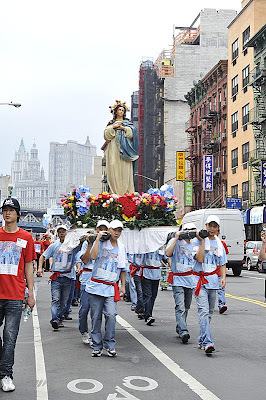 Thursday's Catholic New York led with the shot at left -- an annual Chinese procession in honor of the Annunziata that, now in its 15th year, wended its way through Lower Manhattan with prayers and dancing, culminating with Adoration and Benediction at a local parish. Closer to home, the old-school Italian crew at the Jersey Shore is keeping up its rite of choice, celebrating another "Wedding of the Sea" -- the 15th century Venetian custom of Mass and an open-air procession, culminating in the blessing of the waters proper to this feast -- in three beach towns, including Atlantic City, where the largest of the crowds traditionally shows up on the Boardwalk... followed, of course, by a mass-meal in the parish hall. And for folks of every ethnic and cultural stripe, last -- but never least -- among the big Assumption traditions out there takes place later today along the banks of the Mississippi... just not, however, to bless the river. 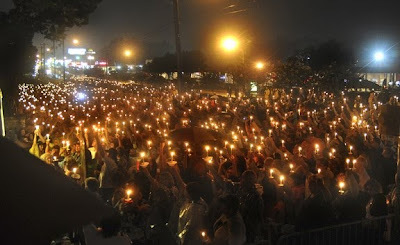 In what might be the most unique Assumption Day treat of 'em all, today's 3pm Mass at St Paul's Church in Memphis will yet again be offered for the blessed repose of Elvis Aaron Presley before the traditional weeklong observance of the King's dormition 32 years ago tomorrow reaches its peak with tonight's candlelight vigil at Graceland. First celebrated in 1993 and traditionally packed out the doors each time, music for the Elvis Eucharist -- which'll fulfill one's Sunday duty -- begins an hour before. Whatever your festa and however you're celebrating it, here's hoping it's restful and beautiful all around.